1. All teenagers love the London Dungeon – it’s scary but lots of fun. And a great way to revise London’s history by the way. 2. A cruise on the Thames sounds rather boring to them? Propose a speedboat one (RIB Tours for example. A James Bond boat chase feeling!). Quite something. Or on a slower mode, a kayak one on the Thames. You can even do stand up paddle boarding on the London canals or try a cool, adventurous walk in the trees in Battersea Park avec Go Ape > several itineraries: Junior Tarzan (6-12 yo), All Apes with 3 versions (13-15 yo, 16-17 yo and 18+), Ape (10-15 yo), Gorillas (16+) or simply Forest Segway, from 10 yo. 3. For the view, there is, of course, the London Eye, The Shard, The Monument, St Paul… but if you want a memorable experience, try climbing the roof of the O2 (yes, it is perfectly safe!). 4. Make their heart beat faster with The Orbit’s spiral slide – 50 m long. 6. Ah, yes, Camden. Go for the shopping experience, for the pleasure of getting lost in the market maze but also to enjoy a street art tour. And a molecular ice cream made with liquid nitrogen at Chin Chin Labs – very sci fi! 7. Take them to Novelty Automation. A London arcade of home-made machines, built by enthusiasts. Buy tokens and play – it’s funny and modern and worth the detour. 8. Give the “London double decker tour” a twist. Here ate two options, both on a vintage double decker: the BB Bakery afternoon tea and the Ghost Bus Tour (not scary, really on the fun/laugh all you can side). And yes, the usual iconic views of the capital. 9. If your kids love street art, stop at the Leake Street tunnel near Waterloo. One of the only legal places you can tag! 10. In the summer, the Nomad Cinema projects a wide range of movies (classics and recent hits) in parks and unexpected places. Bring a picnic, a few blankets, settle down for evening with / under the stars. 11. Teach them geocaching. There are lots of micro-caches in London to be found from just GPS coordinates and clues. It’s rather addictive. 13. Wow them – take them to a Roller Disco. Neon or crazy clothes are highly recommended! 14. Coming to London around Christmas? There will be plenty of ice-rinks around but the best one is at the Somerset House. Rather than booking a “normal”session, check out their Disco Nights and Morning Raves. 15. You already knew of Madame Tussauds’. They have now opened a gallery dedicated to Star Wars. Fancy a selfie with Yoda? 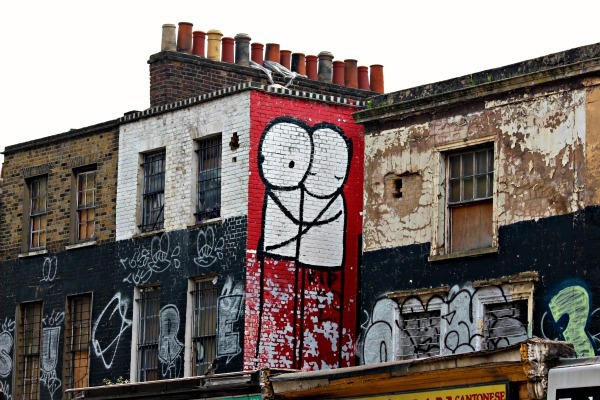 Teenagers might like Alternative London tours! They do both touristy and cooler street art/underground cafes and bar tours on bikes. Worth checking out.